Ambar coloured wine. Light creaminess and pleasant taste in mouth. Of great persistence leaving hints of almound and oak due to its double aging. It also leaves hints of hazel nut and fine wood. Wine aged by a first stage of biological aging, passing to the veil that is naturally lost, then passing to the next oxidation aging process. Cold cuts, aged cheeses, nuts, salads, broiled fish with salt, blue fish, shellfish, smoked meats, game dishes, spiced dishes, pastas, artichoke and asparagus. Traditional system of Criaderas y Soleras, using 500 L barrels made of American oak, previously wined. Ambient temperature between 15-18º C, or chilled between 12-14º C.
Once opened, conserve in a cool place and consume before three months. Intense mahogany coloured wine. It is a round intense well balanced and full bodied. It presents toasted aromas due to its long aging in American oak barrels, with sublime sweet hints of raisins. Elaborated with the variety Palomino Fino. 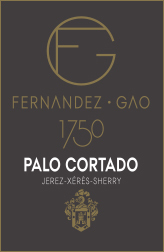 Aging initially under veil and then oxidation aging, at first being an Amontillado, finishing its aging process blending with a variety of Pedro Ximenez. Blue cheeses, patés, quiches, white meats, very spiced and spicy dishes, sweets and citrics. Serving temperature: ambient temperature between 14-16º C, or chilled between 12-14º C.
Consume preferably: once opened, conserve in a cool place and consume before three months. If the wine is closed, it will be perfectly conserved in a cool standing position. Dark mahogany coloured wine. It is round, well balanced and a final intense flavour. It is very potent and explosive leaving multiple hints of toasts and nuts due to its long aging period, which evolutes harmonically. Ambient temperature between 15-17º C, or chilled between 12-15º C.
Once opened, conserve in a cool place and consume before three months. It is recommended to be drunk in a large catavino or white wine glass. Ambar coloured wine. Intense and dry in mouth, with body, long ending and elegant to the taste. It presents clear nutty aromas like almonds and hints of vanilla and toast. 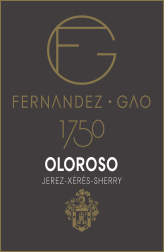 Very complex wine which combines the elegance of the amontillado and the boldness of the oloroso. A real enological rarety. Traditional system of Criaderas y Soleras, using 500 L barrles made of american oak, previously wined. 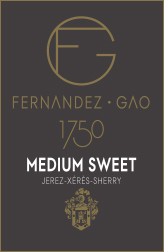 FERNANDEZ GAO VINOS Y BRANDIES SL, CIF B11840121, Avenida de la Solea 6, CP 11404, Jerez de la Frontera, Cádiz.